Whew. The jacket is actually pretty straighforward construction. For this, I cut a size 40 and made a 1/2 inch FBA. I added a center back seam to make my swayback adjustment. 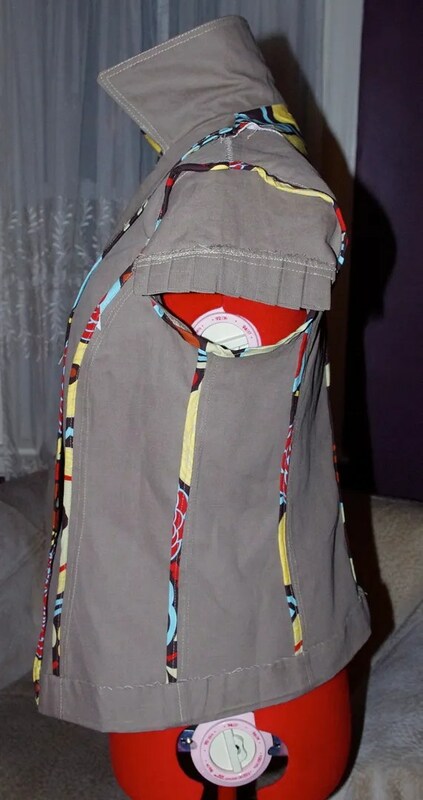 The inside is finished with bias tape which I had to do when my serger died mid construction. But, it’s a beautiful way to finish an unlined jacket. 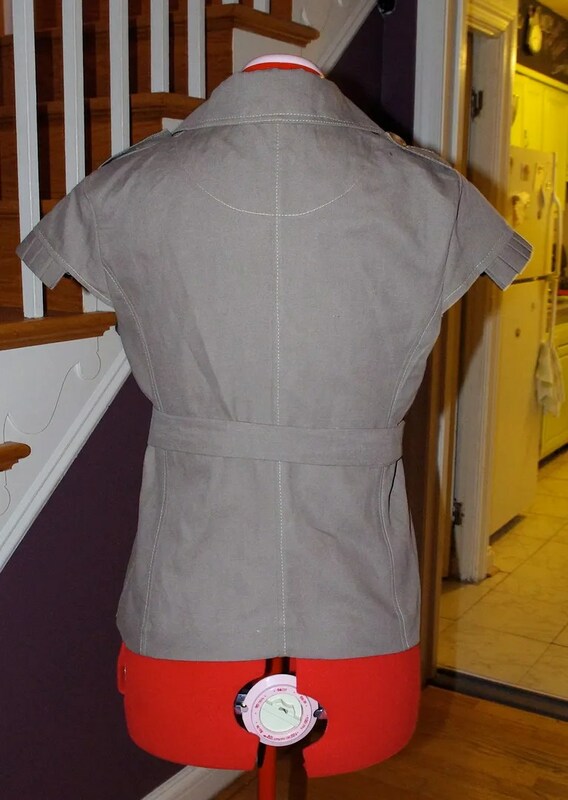 I made the back facing in the same contrast fabric as the undercollar and reverse of the chest gaurd. The buttons were from a FabricMart.com bundle. The fabric is from a Michael’s clearance last year or the year before. Total project? Maybe $20? I don’t know what happened to me, but my handsewn hem is terrible. If this jacket makes it through two weeks of China, I’ll have to even the hem out. I do like all the topstitching. While cute, this fabric was all wrong for this jacket. It’s a very stiff denim – linen blend. It has no sheen whatsover and no drape. It was like making a jean jacket from canvas. The color is also pretty dull on me too. I’d like to find a summer scarf to spice it up. I put the chest flap on the wrong side, not that I think it would make too much of a difference. I left off the pockets (made me look hippy) and the button loops. I don’t like this self fabric belt so I wanted the freedom to use a purchased one. I also placed the buttonholes too close to the front edge. My buttons overlap a bit too much. I leave on Wednesday morning and for the first time in two months, I kind of don’t have anything to sew! I might try and make a sleeping mask. That could be done in an hour, tops. And, maybe an infinity scarf for the plane(s). LOL. I must be crazy. The other fun thing I did this weekend was go to the drive in movie! Toy Story 3. I don’t know if I can go back to the theater after this. So much fun! Super cute! I’ve been wanting to make this since it came out, and it will go to the top of the list for next spring/summer after seeing yours. I love the contrast HK finish – fun and not stuffy! TOTALLY cute. I love it! Sorry to hear that it doesn’t have any drape, but I think it looks fantastic. All of the flaws you outlined above are non-existent in the pix! And I totally dig that fabric you used for the bias binding. It’s like a little gift to yourself when you put on the jacket. And a big whoop! Whoop! for the drive-in. SO fun! Adorable jacket! Was that your first time to the drive-in? We used to go all the time when I was young, but here on the west coast they have all pretty much disappeared! I totally feel your energy for last minute sewing. We leave for the UK in the morning and I am still thinking I can squeeze one more top out. Have a great trip! I hope you enjoy your new jacket. It looks cute, don’t be so harsh on yourself. I’m loving the outfit! Too bad I don’t do Burda…. (not that I never will, I’m just slightly terrified of them, lol). The jacket turned out beautifully; I especially love the detail of the pleating on the sleeves! I must make myself something similar…. You are the only one who can see the problems you have with the jacket. It is absolutely adorable and looks great on you. Love it with that skirt. Have a great trip and take lots of pictures. Wow, nice work, inside and out, and it looks great on you! Bon voyage! Wow! You are on a roll! This is as pretty on the inside as the outside, but sorry about the serger problem even though it worked out for the best. The color looks good on you on my computer screen. Have a safe and enjoyable trip. I always did like that little trench! I love the outfit! C – I love the jacket especially with the contrast fabric. I think you are being too hard on yourself. Have a fantastic/safe trip!!! I have liked this jacket pattern since it came out. Your version is great. It looks like you used the perfect fabric to me. It doesn’t look stiff even though it might have seemed like it when you were working with it. I’ll bet you wear this jacket a lot on your trip. Have a great time and don’t forget to keep us updated on your adventure. I love the trench jacket, and like how you played with the printed fabric. I love the HK finishing and the different fabric on the flap and collar – gives it that Cidell touch! I don’t know if I’d agree with you about being the wrong fabric. 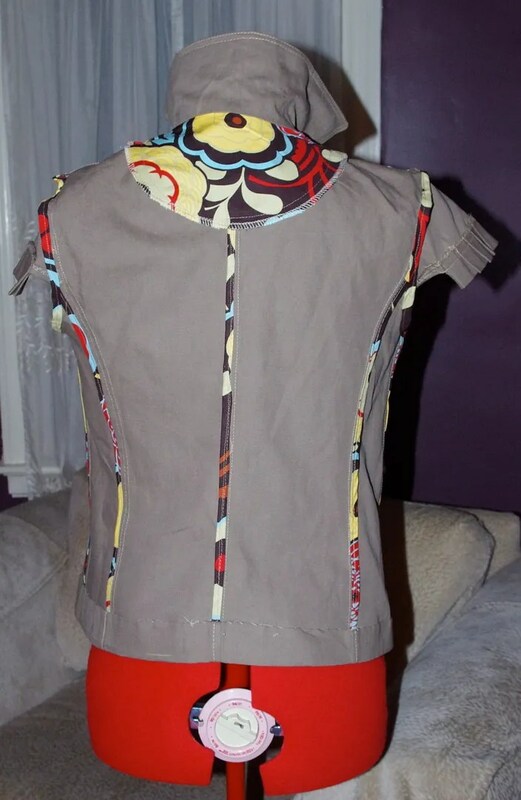 It looks really good on you and it has the requisite fitting seams for a stiff fabric. It’s a great outfit and this is a great tailored look without the heat of sleeves. Have an absolutely fabulous time and hopefully you can sleep on planes. That’s a long ride if you don’t! Super cute! Love, love, love those sleeves! Complain all you want, but I think the jacket looks great on you, especially with that skirt! I can’t see any of the issues you mentioned in the pics & I love your bias tape finishing. This is one of your best creations! I think the fabric is perfect and you can style it’s neutral color with so many items. The print for HK finishing gives such a fun touch. Safe traveling. I love it. Very chic! Looks great! I love the handmade bias trim! 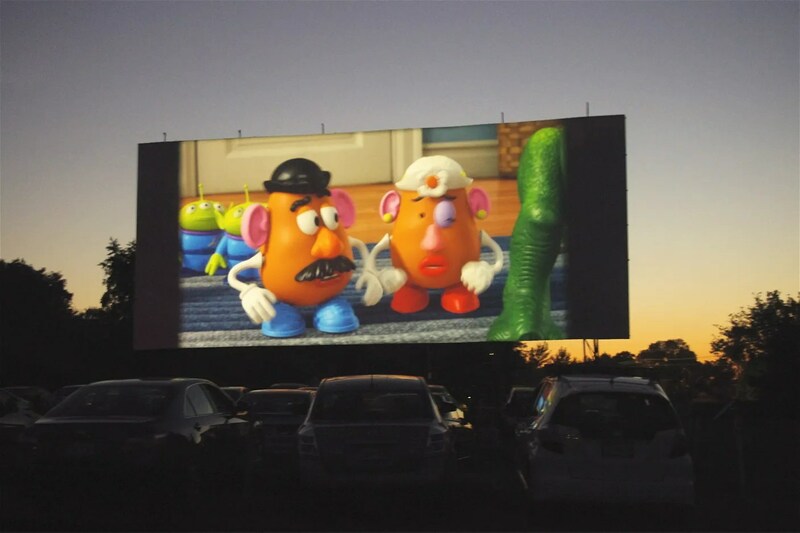 Oo… drive-in movies seem lilke so much fun! Your new jacket is absolutely fabulous. Love the special couture touches and the little surprises (like the happy fabric under the chest guard). What an amazing China capsule! Can’t wait to go to China (vicariously)! I think the color looks really good on you, at least in the photos! And wasn’t TS3 a great movie? Even my 15 year old son wanted to see it, and he got a little misty at the end. The jacket came out cute; the contrast piping inside is a nice touch. It looks good with that skirt. Have a wonderful trip to China, and post pictures for us if you get the chance! Yep, I knew that you could do it. You’ve inspired me to try this coat for my summer collection. This is so you. I love it. One of my treasured possessions is a colourful silk scarf given to me by a young Chinese man who was a student who got stuck here in Australia when the Tiananmen Square thing happened. You will find loads of really lovely silk scarves that will go with this jacket. I haven’t been to the drive in since I was a teenager! Only last week I was wasting time on the internet looking at photographs of long abandoned drive ins all over the world. Very cute jacket!! And you did it in such a short time! I would take me at least a month to do it. Great job! You are certainly in the groove with your sewing. I love this jacket and even better I love how you styled it. You look so alive! Enjoy your trip to China! Great job! I have a questiong–at what point did you finish the seams: after cutting out but before assembling or after assembling? I’m still trying to work seam-finishing into my construction process. Also, may I humbly suggest that you either make (or purchase) neck pillow for your long flight(s)? I was skeptical about them until I had a series of really long flights (SF – NY – Cairo, then the reverse). They are really helpful! I absolutely love it! And, the inside looks so pretty. This is in my tracing queue now. Enjoy your trip, we will miss you! What size buttons did you select? I’m making a Burda dress and didn’t know what looked right. Yours look right for the item. Looks great btw! Have a great trip. Renée, you are sooo evil!!!! What would I need a PLEATED SLEEVE saharienne for???? I have no idea but you make me want one. Mezanmi! It looks great on you – so fun! Yes, I definitely so much want to make this! I don’t know how the colours/tonal values differ in real-life, but in the photos that colour looks great on you! And I actually really like the self-fabric belt. This only thing I’d change are the buttons. They look too yellow-y in the photos against the jacket colour. I think what would look awesome (in my humble opinion) are buttons the same dark brown as the belt buckle. And I think having them match in colour would increase the sophistimicated-custom-couture feel of the whole. But it’s still awesome for your trip as-is! I totally agree about the button colors. I went went these because they were the largest I had in the house. But, will be looking for big brown ones on my trip! Awesome jacket! I love how it turned out. You are such a show off finishing the inside of the jacket like that:) Just kidding, I’m just jealous I didn’t do that on mine. Yeah! Good for you :-). I freakin’ love it! So snazzy on you, and you did such a great job with it. Have a great trip, and yes, please post lots of photos so we can live vicariously through you. Love this on you! Talk about showcasing your tiny waist! I loved the jacket when you posted the first picture, but it looks even better made up. 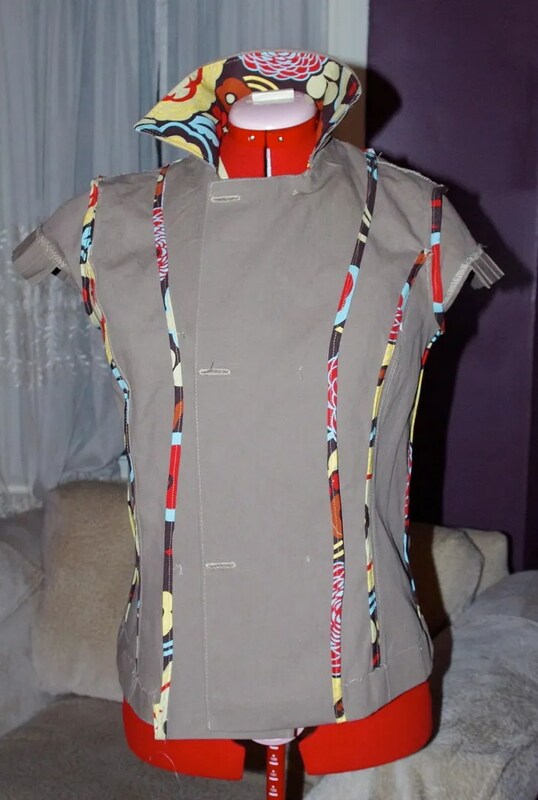 Anybody got a Burda Style 4/2008 they’d be willing to sell me? Must. Have. This. Pattern. I love your jacket. I want one just like it! I like the jacket, especially the pleated short sleeves. Very flirty. Khaki is one of the colors that I hate to work with because I find it dull, but then it becomes a workhorse in my wardrobe because it is a neutral. I think it is a wonderful jacket. Have a great time in China! So cute! The Hong Kong finish is too adorable. I hope you have reached your destination by now!!! Despite your concerns, that jacket is pure hotness! The way you have it styled is perfect. A well constructed jacket with a lively print. Well done. Is that Benjie’s?! My kids love going there! I’m dead asleep half-way through the second show though. Wow, love it! That ‘flash’ of colour makes me smile. Well done! 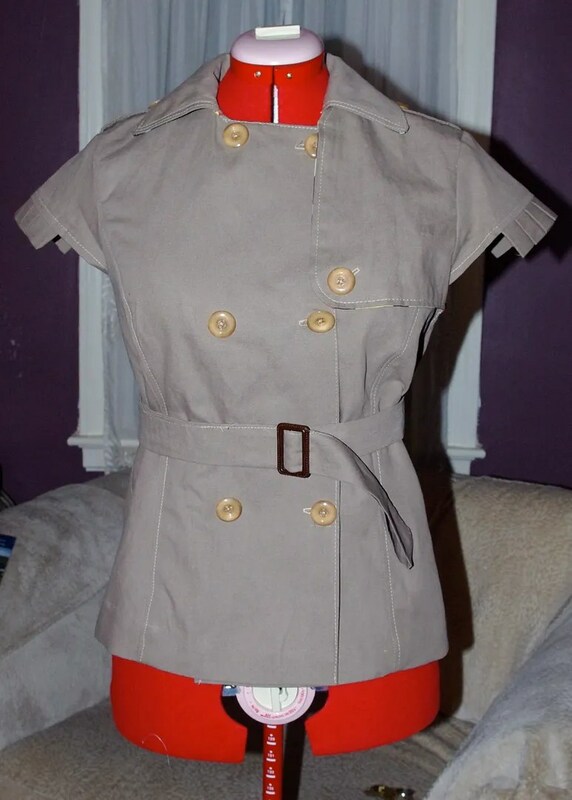 Great jacket, I don’t see a button placement prob, nor breast flap ont he wrong side, and I really like your self-fabric belt, it turned out beautifully! You must have pressed that sailcloth er–linen–into submission! Burning question: what will your nail wardrobe be? BTW, I doubt if China sells nail polish remover in the handy pot/sponge combo, it’s probably still available only in bottles to remove with tissue. I never found it in the pot while I lived in Asia, nor even here in Belgium. Alert: Elise cautioned me that blog access is difficult in China due to censorship. You need a proxy server. YouTube access is similarly difficult. We miss you Miss Celie. GORGEOUS! I love it on you. Have a fabulous time!!! Love it! Love the Tracey Reese dress. You’ve been a busy sewing bunny. I’m totally impressed w the output and notice that you’ve def kicked it up a notch. So, are you back yet? We’re 2-3 weeks away from Baltimore. And right now I’ve got the first decent computer connection I’ve had in months, so I’m perusing the blogs. Tomorrow we’re leaving here and then we’ll be back to Droid access only. Hugs on the break up thing. ugh. Awesome jacket. Looks great and the finish with the print fabric is so fun. Great work!